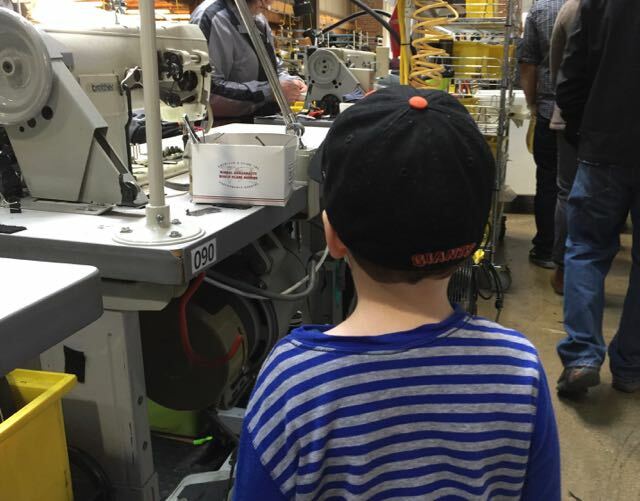 Our factory tour-themed week of spring break concluded on Friday when Wyatt and I went on the Timbuk2 factory tour. The tour is offered the first Friday of every month, so if you weren't there on April 1, there will be plenty of other opportunities. You can reserve your free tickets to the tour on their website. Our group of about 20 or so visitors (honestly, I didn't count) began the tour in the Timbuk2 shop on Shotwell Street, where our energetic and knowledgeable tour guides gave us a brief history of the company. We then followed our guides next door, into their offices, to see some bag designs that will be available for purchase later in the year. We peeked into the lunch room, saw April Fools prank bags from previous years, and had the opportunity to admire peoples' workstations. Wyatt also found the foosball table. Our third stop was the factory itself, where we saw several expert sewists stitching bags together. We learned, among other things, that Timbuk2 follows the Toyota model of production, every sewist can perform every sewing task necessary to making any of the bags, and it takes just 18 minutes to make a classic Timbuk2 messenger bag. 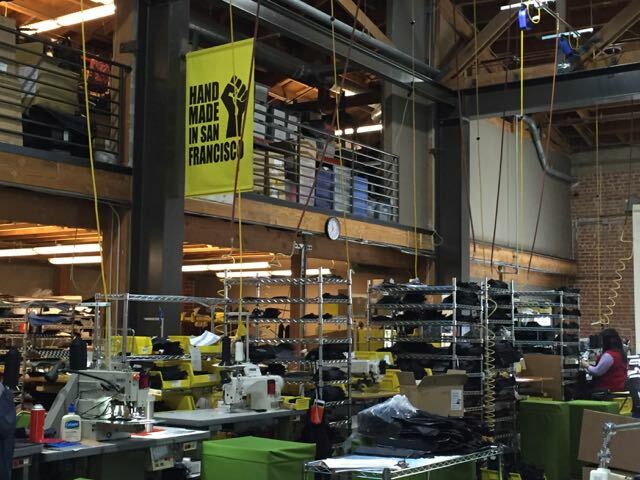 The San Francisco factory is just one of the factories where Timbuk2 manufactures its products. The other factories are located in Indonesia, Vietnam, and China. Our final stop on the tour was the second floor of the offices, where we spoke to a designer who showed us her process for designing bags for manufacture, and we got a sneak peek at designs that won't be released for a year or more. If our tour guides' goals were to give us an understanding of Timbuk2's corporate culture and a serious case of bag envy, they largely succeeded. 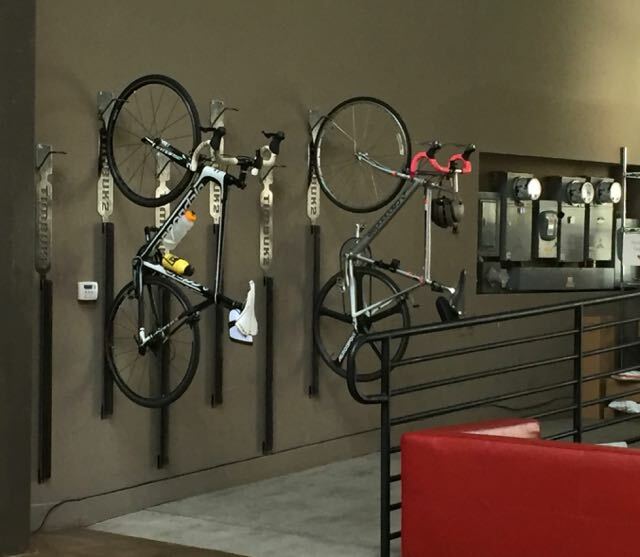 It seems like Timbuk2's employees are mostly young, fun loving, work-hard-play-hard types who are devoted cyclists and self-described "bag-geeks." 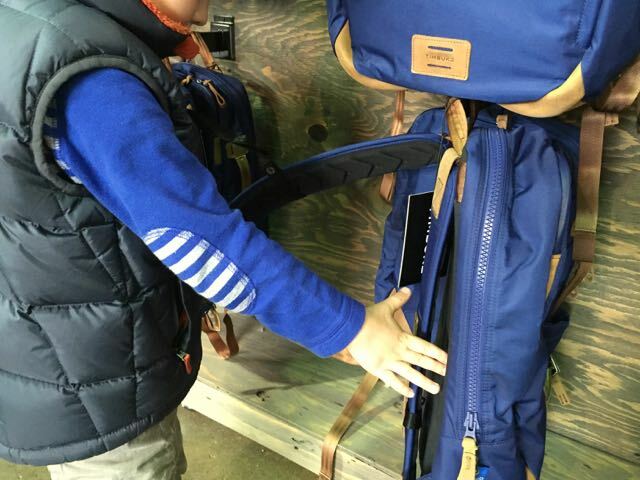 And some of the bags I saw that will be coming out in the next year (or more) are more fashion forward than Timbuk2's traditional backpacks and messenger bags. Wyatt loved the shop, trying out the buckles on the bags, and he even found a couple of bags he really loved. But as far as the tour went, he said, "It was okaaaaaaaaaaaayyyyy, but all they did was show us bags. And talk about bags. I couldn't see much what was going on, and they didn't show us any big machines. I liked the sewing machines, but we spent hardly any time in there. And they didn't give us any of the pieces they sew together." He gave this ranking before he received the "thank you for touring" postcard from McRoskey. McRoskey may have secured their #1 ranking for awhile with that one piece of mail. 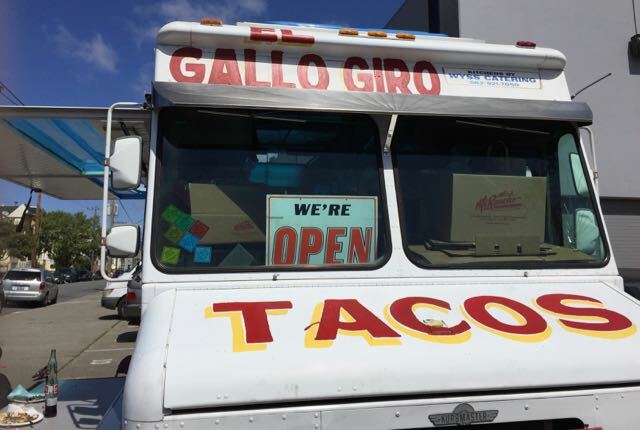 But the Timbuk2 tour was definitely fun, and it got us within easy walking distance of what Wyatt declared to be "The Best Tacos In Town" from El Gallo Giro, a taco truck that parks on Treat at 23rd Street. 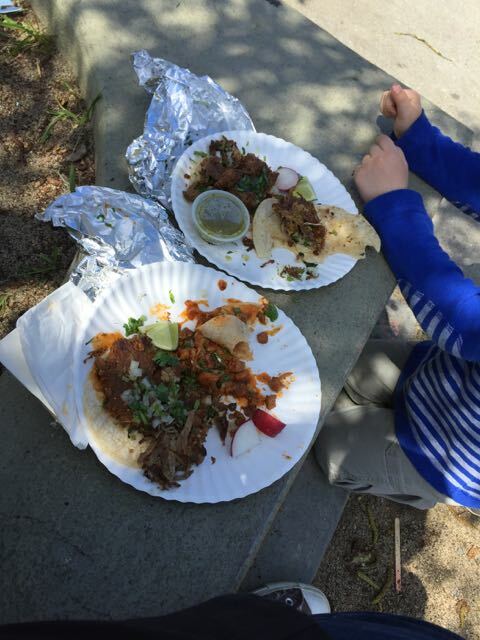 The carnitas tacos were the best I have had in ages, and lunch cost a total of only $8. And guess what? There's still an ENTIRE WEEK LEFT OF SPRING BREAK. And I'm out of tours. So the current plan for the coming week is to start another cheese (a gorgonzola style, this time), visit a museum, maybe spend some time exploring neighborhoods we rarely visit, and probably eat more tacos from El Gallo Giro.